Are you looking for a reliable data recovery service to recover your lost data from an SSD? Your search for an expert SSD data recovery services ends here! Platinum Data Recovery is the name you can trust to recover your lost data from a failed solid-state drive. The solid-state drive (SSD) is a famous data storage option for your devices. Many computer users assume that solid-state drives cannot crash or suffer other issues commonly associated with traditional hard drives. However, no matter how dependable the storage device is, sooner or later it wears out. But don’t worry because we have the technical skills and state-of-the-art facilities to offer you the industry's best services for solid-state drives. Data recovery from SSDs is highly complicated. This is because SSD recoveries require special knowledge to avoid further damage and data loss. Our team is experienced in full data recovery from all types of data loss on SSDs. These drives usually fail without showing any signs and symptoms of damage. Unlike hard disk drives that have an identical make, SSD's and Flash present unique and different makes, which poses a challenge for SSD recovery. Thus, when you need a dependable solid-state drive data recovery expert, Platinum Data Recovery can help. An SSD (solid-state drive) is a type of nonvolatile storage media that stores data on solid-state flash memory. It uses NAND flash memory to access data and has no moving parts. These drives are more shock resistant and are commonly used in tablets, laptops, and desktop computers. As compared to hard disk drives, Solid State Storage Devices have no moving parts. This is an emerging storage technology that promises lower rates of failure than other forms of storage media. However, similar to any form of data storage, these advanced drives still fail. Logical failures of SSD drives are uncommon but not impossible. SSD data recovery may also be required in the event that a user error causes the drive to fail, including the inadvertent admission of a malicious virus, program or malware, or when a user mistakenly deletes valuable information. In most cases, physical errors in solid-state drives are related to an electrical problem such as an incorrect power supply, a power surge or some other electrical error. Also one of the most popular problems is a damaged controller chip. Physical SSD data recovery solution must be applied that includes repairing the device to a usable state and the using state of the art technology and analytical equipment in order to properly extract the data for secure storage on a working device. SSD data recovery for a physical drive failure can be related to direct damage to the device such as: compressing it; extreme temperatures or humidity; or exposing the device to water, beverages, food items, dirt, and other debris and contaminants. Experts at Platinum Data Recovery can overcome technical challenges that are unique to SSD and flash technology. Attempting a recovery procedure on your own could result in permanent data loss because of the complexity of these drives. Our engineers have been providing cutting edge solutions to successfully recover data from all types of solid-state drives (SSDs). SSDs usually don’t show any warning signs and symptoms of damage. It often stops working or responding which means the drive has failed and may result in data loss. While a physical hard drive failure might seem like an easy repair, it is the equivalent of complicated surgery. The components of an SSD are generally quite complex in nature –- most are microscopic and the tools and equipment necessary to bring an SSD data recovery project to fruition are expensive and require an expert to wield correctly. Extensive electrical skills are required for a job of this nature. Platinum Data Recovery engineers have the expertise to deal with the complexity of these drives and have experience in recovery procedures of SSDs of different manufacturers. We have developed strategic technical relationships with prominent SSD and component manufacturers which enable our engineers to recover lost data from SSD and flash devices. sooner you call us, the sooner your valuable data will be back safely in your possession. Take action and call us now. "I would personally like to thank David Green and the Platinum Data Recovery team for saving important data that we needed to perform critical historical reports... 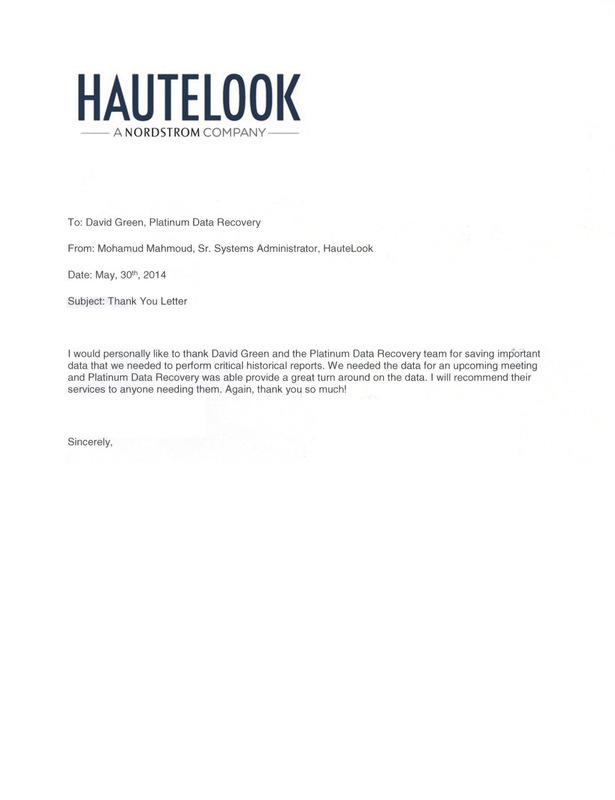 Platinum Data Recovery was able to provide a great turn around on the data."